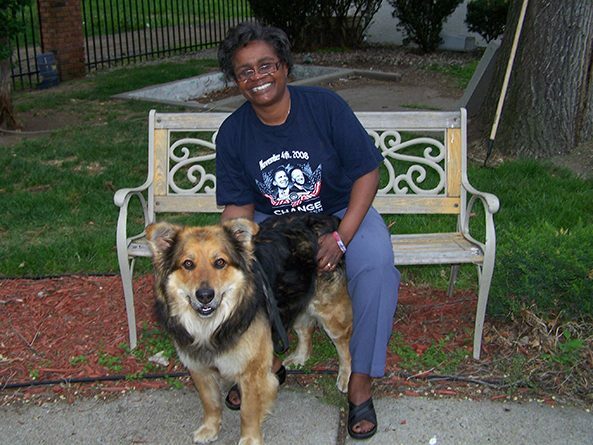 Above: Sen. Brenda Council poses in her yard with Boo Boo, her shepherd-chow dog. When Sen. Brenda Council returns to her Omaha home after a long day at the Capitol, she can always count on her dog Boo Boo to welcome her. “He’s the first one to greet me when I get home,” Council said. The 70-pound shepherd-chow mix has a special place in her heart. She once drove 1,400 miles round trip to retrieve him after he ran away during a family visit in Arkansas. “People think I’m crazy when they hear that,” she said. Boo Boo was missing for about two weeks, but Council kept calling her family in Arkansas to see if there had been any sign of him. Much to her relief, Boo Boo eventually turned up. This character trait of not giving up can be traced through Council’s public service history. She is energized by challenges. Growing up in north Omaha, Council said she has always been interested in improving the quality of life of her neighbors. Her first opportunity to do that came when she returned to Omaha from her first job as a practicing attorney in Kansas City. Motivated by a recent decision by the Omaha Board of Education to cut summer school, Council decided to run. After getting beat “pretty soundly” in the primary, Council came back to win the general election and served on the board for 11 years, from 1982-93. During her service on the city council, she decided to run for mayor. She lost, but ran again and lost by less than 800 votes in 1997. In addition to elected office, Council also has been an active supporter and board member of several community organizations in Omaha, such as Boys and Girls Club, Latino Center of the Midlands and North Omaha Economic Development Project. Council attributes her commitment to public service to the opportunity it affords her to make a positive difference. Becoming a state senator has also been a rewarding experience for Council, although it has required some adjustment. Between her daily commute and her legislative duties, Council said she doesn’t have time for much else. “I used to have hobbies,” she said with a laugh. In fact, she completed a marathon in 1998 in Bermuda as part of the Leukemia and Lymphoma Society Team in Training. But Council said her marathon days are over. These days she’s happy to find a few moments to enjoy with her family and, of course, with Boo Boo. “He wants as much attention as he can get,” she said.